Remember how much fun you had playing pretend as a kid? It was so freeing to slip into different roles, imagine yourself into fantastic worlds, and make up stories based on your favorite books, drawings, or even songs. Those same activities that come to us so easily as children can have surprising therapeutic results for seniors suffering from memory loss. Rather than trying to recall memories that have been deteriorated by dementia, which can be frustrating for both the senior and the family members, they can instead focus on sharing their thoughts and feelings through different channels. 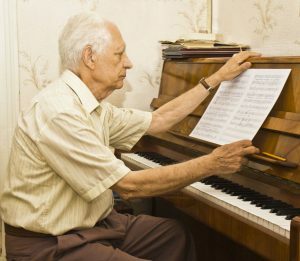 Several studies have shown that seniors with Alzheimer’s love creating backstories for pictures, imagining what inspired song lyrics, and other imaginative exercises. Creative expression (CE) programs can have a big impact on seniors’ quality of life, whether they’re in a retirement home or other senior living setting. Because they engage seniors intellectually and emotionally, these storytelling and artistic exercises can sometimes help prevent or reverse mood disorders like anxiety and depression. One study found that “as residents become engaged, and as staff and family provide positive reinforcement for the residents’ creative work, their mood may improve.” After all, we all love to have a chance to communicate with those close to us and share what’s on our minds. There’s so much room in these questions and their responses for humor, wit, and keen observations. It’s easy to get caught up in the evolving relationship between you and the senior you love, or about the progression of his or her memory loss symptoms. Sometimes that makes it harder to what sparks joy in your loved one. In an effort to help them laugh or share what they’re thinking about in that moment, simply sharing social time and communicating is so important, regardless of memory skills. You just might be surprised by what a positive effect it can have on your loved one’s quality of life, as they navigate relationships with others in their retirement community and respond to events in their everyday lives.